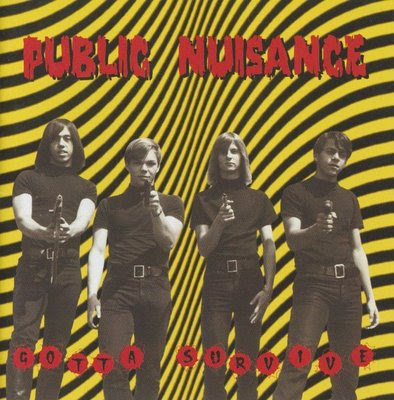 In 1968, Public Nuisance recorded a new demo on a four-track machine operated by Eirik Wangberg at his new center of operations, Sound Recorders in Hollywood. This is an LP-length recording, produced by the band, that makes up disc-two of the Gotta Survive double set. In even a cursory review of this music, it is apparent that Fantasy made an enormous blunder in letting this band get away! Punishing fuzz guitars, pummeling drums - it's like someone commanded The Savage Resurrection to record a follow-up to The Who Sell Out! Aside from a cover of The Beatles' I'm Only Sleeping, the material is all original and is not to be missed by any and all fans of late-sixties rock. Time Can't Wait sounds like a '66 punk 45 side with better production; Pencraft Transcender has thick fuzz reminiscent of the Canadian Plastic Cloud album; Darlin' and Katie Shiner have a distinctly British underground feel that readers will associate with the Chocolate Soup For Diabetics UK compilation series. For a self-produced demo tape, it's a phenomenal achievement. Wangberg thought so, too - and in the course of playing it for visitors to the studio, brought it to the attention of producer Terry Melcher (Paul Revere and The Raiders, The Byrds) who envisioned Public Nuisance as (indeed) an American-made British rock band. He had the group back to Sound Recorders and under the watchful eye of Wangberg in 1969, with a simple prime directive: make a British rock album. This new recording (disc one of the double set) is every bit as powerful as the 1968 demo. Love Is A Feeling and Small Faces are violent freakbeat a la Creation/Who/Pretty Things, while Evolution Revolution could fit on Tomorrow's album. Strawberry Man is pleasant power pop until the last minute, when it explodes into a maelstrom of druggy pyrotechnics. The only noticeable difference between the two sessions is a hint of a British accent on the vocals on this later recording. None of the material from the 1968 demo repeats here - this is a completely original album-length master that, due to Melcher's self-imposed exile following the Manson incident in August, was shelved and forgotten. Not long after, the band split. Brenda, you take the most amazing phoots! I love wandering over to your website every so often to see what you have posted. These baby pics are especially precious. :-) God bless!